Summary: Light rain on Tuesday and Wednesday, with high temperatures bottoming out at 64° on Tuesday. Austin Lashley launches off Smelter Mountain on Saturday morning. It was the first day paragliding was legal in the area since 2010. Austin Lashley flies below Smelter Mountain on Saturday morning. “It was a little bumpy. It was little what they call thermic, but it was good,” he said. Smelter Mountain was open for legal paragliding for the first time since 2010 on Saturday. “It was a little bumpy. It was a little what they call thermic, but it was good,” said Austin Lashley, who launched off the mountain at about 11:30 a.m. He had planned to fly with a group of pilots early in the morning, but they decided against it because a storm interfered with what are usually favorable morning winds at the top of Smelter. The Silverton resident decided to fly later when he noticed conditions had changed. “I booked it up there and there were a couple ravens and vultures soaring on the ridgeline the whole way up. It was good to know I wasn’t making a trip in vain,” he said. 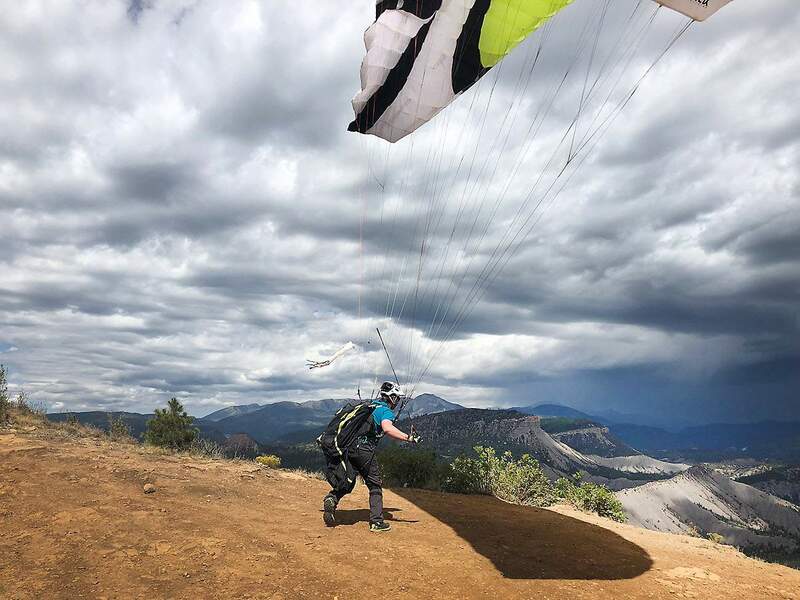 The mountain was originally closed to paragliding and hang gliding because local law enforcement had public safety concerns about the activities and asked Colorado Parks and Wildlife to close the area to various aircraft. However, the rule wasn’t enforced until 2016. 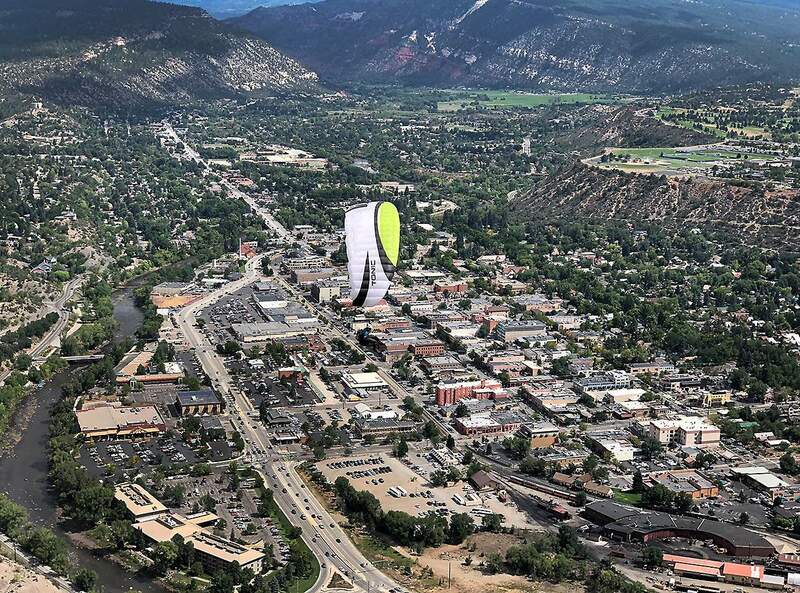 Public safety personnel were concerned paragliders would distract drivers; they might interfere with public safety communications towers; or they might have conflicts with those using the Durango Dog Park. The request in 2010 prompted CPW to ban aircraft from taking off from any state wildlife area. The agency decided to allow just paragliding at Smelter Mountain in July after a citizen’s petition. Durango paraglider Randy Hughes petitioned the state to change the rule, arguing paragliders had used the area for decades with little to no conflicts. Initially, local authorities opposed the change, but in the interim, lingering concerns were worked out, CPW officials said, in July. “We were fortunate to have common sense and cool heads among the people that were making the decision,” Hughes said. The change in the rule applies only to paragliders. Hang gliders typically require a road to access their launch points, and the road to the top of Smelter is closed to vehicles, he said. Hughes was a member of the group that planned to paraglide together Saturday morning, and he hopes to fly there in the next few days when conditions are right. “We’re really excited to have the opportunity to fly it again,” he said. It is a particularly convenient spot for the local paragliding community of about 20 to 30 people. “It used to be a great pre-work way to start your day – Get up at 6 o’clock in the morning and still be at work at 8 o’clock,” Lashley said. Could paragliders return to Smelter Mountain?